Winter weather can pose several risks to your pet’s health and safety if you aren’t careful. With some basic precautions, you can ensure your pet’s health and welfare when old man winter shows his ugly face. Here are some basic safety tips to keep in mind this winter. Your pet’s tolerance to cold weather varies based on a number of factors, including breed, age, fitness and health. Conditions like arthritis are often exacerbated by cold weather. Senior pets may have more trouble maneuvering during the winter. Likewise, those pets with heart disease, diabetes, or kidney disease, may be also be more susceptible to temperature extremes. If you have a short-haired dog we would advise not bringing your dog out in the cold without some sort of sweater or coat. Monitor how your pet reacts to the cold and make adjustments accordingly. 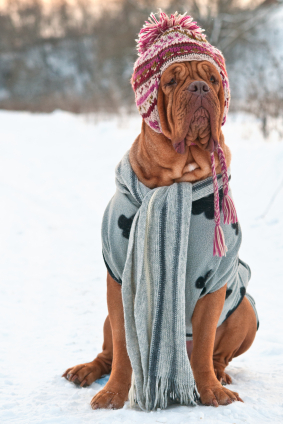 If you have any concerns about how cold weather will affect your pet’s health, consult with your veterinarian. In addition, another winter hazard exists that we need to steer clear of. The salt and other chemicals used to de-ice roads can be an irritant to your pet’s paws and can cause ulcers if ingested. If your pet walks over a patch of salted road, wash their paws with warm water as soon as they are back in the house. This will avoid any irritations to your pet’s paws and will ensure that he does not lick the salt off of his paws, causing further irritation. To prevent irritation to your dogs paws you can also purchase PawZ (or a similar product) which are rubber booties used during winter weather as well as rain weather to protect your pet. They are a disposable and reusable waterproof dog boot. Snow, especially near roads or driveways, can absorb chemicals like oil and anti-freeze, which can cause severe indigestion, and in large quantities, even kidney failure. If you notice your pet eating from a colored patch of snow, contact your veterinarian immediately. If possible, please try and prevent your dog from eating the snow. Believe it or not, some animals, cats especially, who are looking for shelter from the cold will often crawl underneath cars or under the hood. Before you start your car, look underneath the car and the hood, and honk your horn to make sure your car is clear if you suspect there is a possibility that an animal has taken refuge. Do not leave your pet in the car. Much is made about not leaving pets in the car during the summer months, but the same principle applies during the winter. Cars heat up rapidly in warm weather, and cool rapidly in cold weather. Anytime you leave your pet locked in a car, you are risking exposing them to extreme temperatures, which can be very dangerous. Be prepared for possible power outages. There is an increased chance of power outages during the winter, so you should make sure you have an emergency kit prepared for your pet in the event that you are without power. The AVMA recommends including a supply of food, water and any medications your pet needs that can last five days. Also, be sure to include blankets or sweaters, so you have a way to keep your pet warm if you are without heat for a long stretch of time. Remember, don’t over due it. Your pet needs to acclimate to the cold just like you do. Enjoy the change of season and be mindful of the above. Together we can help you enjoy the outdoors with your pets best interest in mind.